A few days ago, one of my Facebook friends posted a photo she had taken at the University of Arkansas which she was touring with her college-bound son. The photo was a sculpture made of wood, twisted into cone shapes with doors and windows, about 12 feet high. I recognized these sculptures although I had never seen them before. In the summer of 2013, our family was in Springfield, Massachusetts, one of the stops on a meandering road trip. Our prime reason for being there was the Basketball Hall of Fame, our second Hall of Fame in as many days. Yes, we had come from Cooperstown, NY, where we enjoyed a visit to the Baseball Hall of Fame. Both were fun in different ways. The Basketball Hall was much more interactive and William got to work off some energy there and have lots of pictures taken. William keeping the great rivals Michael Jordan and Larry Bird separated. When we left the Hall of Fame, we were walking on a quiet street in Springfield when Dan led us into a pretty park/courtyard. We discovered we were in the company of some old friends. We were in the Dr. Seuss National Memorial Garden at the Springfield Museums. Dr. Seuss (Theodor Seuss Geisel) was born in Springfield. Sculptor Lark Grey Dimond-Cates, who is also Geisel's step-daughter, created the endearing bronze sculptures of Dr. Seuss and his most beloved characters for the Springfield Library & Museums Association, located in the heart of this city which is on the Connecticut River in Western Massachusetts. Here's Dr. Seuss with The Cat in the Hat and other characters in the background and below. As we stopped to look at The Lorax and to read the inspiring inscription that accompanies him, we got our first good look at the large sculpture made of twisted wood that was behind him. 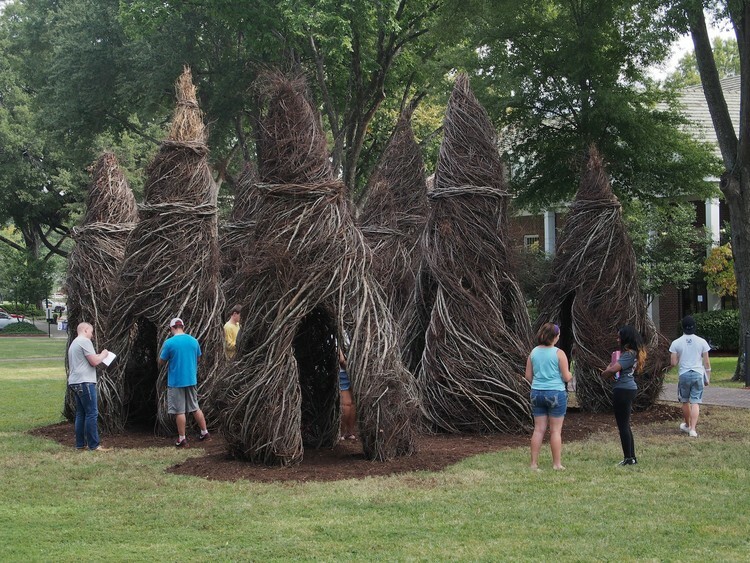 When we did our research on the sculptor, we found he was Patrick Dougherty and that he's made these wood sculptures all over the world. I can't begin to describe them all so please go have a look at them. They're really interesting! I'm glad to have a chance to look back at another of our enjoyable trips but I also appreciate how it came about. I liked that Kyran Pittman – from Newfoundland but now from Arkansas – posted a photo with some sculptures that I, here in Nova Scotia, recognized because I'd seen his work in Springfield, MA. There's an interconnectedness – a small-world-ness – that I find very enjoyable. How interesting. I love organic looking sculpts have you seen the photos using people with straw headgear. I'll see if I can find the photos and post them.